Based on the true story of 'Irish' Micky Ward, "The Fighter" chronicles the local Massachusetts working class hero who fought through trials and tribulations both in the ring and within his personal life on the rough road to a welterweight title. "The Fighter" is built up and advertised as a modern day Rocky, chronicling a real story of 'Irish' Micky Ward. A working class hero who has had his share of struggles in the ring. The film's best moments and real depth however are the conflicts outside of the boxing ring. Maybe a better way to put it is, the true story is better at being family dynamic drama than it is a boxing or sports drama. This is to say that the boxing throughout the David O. Russell film felt more like a backdrop than the real focus. The real focus is one brother's desire to keep his family close to him no matter how much they've held him back. Micky Ward is indeed The Fighter but so are his brother Dickie Eklund and mother in their own regards. Eklund's well documented drug addiction and his mother's inability to do what is best for her sons, are the moments that shine throughout "The Fighter," instead of the moments in the ring. Ultimately, the film ends up doing a far better job developing the struggle and fight of Dickie Eklund, than it does the rise of Micky Ward as a boxer. The knockout in this film is the performances. Christian Bale, Melissa Leo and Amy Adams are each phenomenal in their own regard. As for Mark Wahlberg, well he's Mark Wahlberg, but I'll get to him in a bit. I want to talk about Mr. Invisibility himself, Christian Bale. Bale delivers a Academy Award worthy performance. He actually steals every scene he is in and becomes the character I cared the most for. Cared for him is actually not the right analogy because I hated him, but in the best way possible. He does such a fabulous job of being the crack addict brother you are pulling your own hair out wishing he'd just get straight and help his kid brother Micky. Not only does Bale act the part without error but he also looks the part. Bale once again dramatically shifted his weight to resemble Dickie Eklund in his battered self and the result is a staggering sight to behold. Melissa Leo who two years ago earned herself an Academy Award nomination for Frozen River is once again on point. Leo like Bale, completely becomes her character showing off her raw talents. Leo plays the mother of nine children without error. Her character Alice, also leaves you frustrated with the poor decisions she continually makes. Leo shines brightest in her scenes playing off the rest of the cast. Especially the scenes with her seven daughters at her side ready to throw in a "What she said" or a "Tell 'em mom" mentality. Alice while having good intentions for her son's in actuality is a deterrent to them both and watching as Micky becomes aware of this is some of the most powerful moments within the film outside of Dickie's troubling addiction. You can't mention Micky becoming aware of his family issues without looking at the character of Charlene portrayed by Amy Adams. Charlene plays a pivotal role in Micky standing up to what has held him back for years. Adams is electric in her performance. Gone is the goodie-two-shoes we've seen her mainly play, here in "The Fighter," Adams goes against that typecast in tremendous fashion. Adams has some heavy scenes to carry opposite Wahlberg and she does it in stride. This essentially brings us to Mark Wahlberg. Wahlberg is good in the role. Yes, just good. Why? Well mainly because Mark Wahlberg only has one character he can play well. Sure their are varying levels to his one character, whether it be comedic or more serious, but overall Wahlberg is a one note kind of actor. That is not saying he's a bad actor or doesn't get the job done. Hardly, Wahlberg was essentially made for this role, problem is we've seen him play variations of it for awhile now. Also calculate the flawless performances around him and it becomes difficult to really be blown away by his portrayal. For all intents and purposes Mark Wahlberg does a good job in "The Fighter" just don't expect to see any mention of him being nominated for this performance. There should be some mention of director David O. Russell and cinematographer Hoyte Van Hoytema's ability to make the drama feel like it featured actual historical footage. Both Micky and Dickie were well documented on television and the polished ability to re-create some of that footage is well displayed on screen. Russell and Hoytema have a number of scenes that appear to be directly lifted from archives, while in actuality, there is zero real footage of Micky Ward fighting. 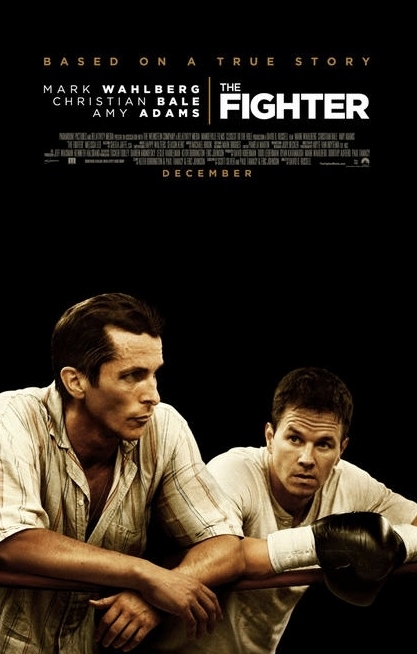 "The Fighter" both struggles and thrives off of its true story platform. The drama has two stories that could mesh together, but for some reason don't. The drama in actuality feels like two separate films. One an addiction drama, that follows Dickie Eklund and his bitter struggle with a crack. How it has affected his career and family. The second, a sports drama, that focuses on Micky Ward's second chance at fame in the boxing ring. Much like a boxing match these two stories duke it out on screen with the addiction drama delivering the knockout blow. Dickie, as a trainer constantly told his kid brother to go head to body, head to body and while that pattern helped propel Micky to a welterweight title, it did not help the film in the slightest. Watch the interviews, trailers and behind the scenes of The Fighter and many more videos.